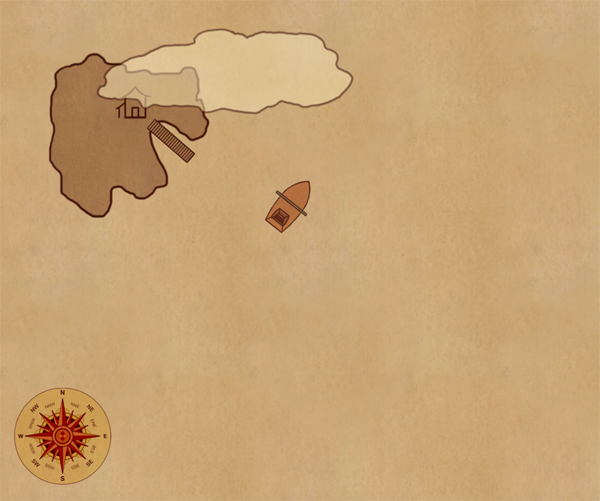 A short game about delivering messages - by boat. An update: UI and looks-wise I'm quite satisfied so far, but I've been having a rough time getting the right messages to pop up at the right time, and it's frustrating me because I'm not sure what I'm doing wrong. I had a lot of fun challenging myself with this jam last year, resulting in my first ever video game! This year I'm going to make something rather different; I recently started learning Construct 2, and now I want to put my acquired skills to good use. My idea was to make a short top-down puzzle game where you're the postal service who delivers letters from one island to another with the help of your trustworthy sailboat, The Orange Casket. I've already made a mockup of the basic gameplay and am now working on creating assets and thinking about what the win conditions etc. should be. My biggest upcoming challenge is that I want this game to have popup screens with dialogue and I've never tried something like that before. Thank you!! Also, yes, visual novels are fun (which is why I was so determined to make one myself)! If I ever make a dating sim or VN again I'll ensure to include an option to talk about Democratic Socialism ;) thanks for your comment! This game looks super well made...I am also super terrible at it. Hey, thanks, I appreciate this a lot! This robot is my best friend now. I'm making us friendship bracelets. I love how this looks and sounds. The colors especially are fantastic. It has a very relaxed vibe. I'm sorry we couldn't see more of what this game could've become, because this demo really speaks to me. Oh man that CC is very good. I love the earrings? Also the fact that your mouth moves with the dialogue options is A+. Thanks for playing and for your response!! As for the lack of variety in the topics, I...well. It's a fair point I hadn't even considered because I am autistic and don't...actually know what people would talk about in this sort of situations because it just doesn't come naturally to me. I also have too much pride to ask other people lmao. This, I guess, is something to work on as well. Thank you so much! To be honest I wish there was more #content, but as it turned out a lot of my energy went towards coding instead of writing. Anyway, thanks for playing! ETA...I agree on the socks & sharks part actually. Haha, nice try, but I don't think I could. ;) If anyone else needs some help though, I'm more than willing to lend a hand! Well, I guess I just posted my first game ever! I had a few friends play through it today to test it for tone and length. A single route is, depending on how thoroughly you play it and how fast of a reader you are, 5 to 15 minutes. The game in its entirety contains a little over 3.3k words. I'm really hyped about finishing this. I'm more of less done writing and coding the main game, and now I'm up for some end-game goodness based upon the choices you make during the dates. I had a bit of a struggle with the coding earlier today but after a lot of trying things out and getting utterly frustrated with the whole thing, I think I finally got it! I've been trying to do exactly that and it has been going a little smoother. Thanks! The past two days I've mostly been working on writing dialogue, which is more difficult than I anticipated, in the sense that it's not coming as naturally as I'd expected. I want to display the awkwardness of speed dating as well as make the conversation natural and interesting (right now I'm mostly failing at the 'interesting' part). I think I'm also setting the bar way too high for myself for this being my first game. Oh well. That running animation is GREAT. I'm not unhappy with how this looks right now! (ETA: I also definitely need to move the question bars to below the face lol). So far I haven't run into any major problems but if I do I might take up on your offer! I've started making sprites and thinking up stories/personalities for the candidates. I can't really figure out how to insert images here, but here's a link to the main background for this game. ETA: Oh. The image doesn't show up for me? That's a bummer. Is it all right to post WIPs/excited rambling about the process/frustrated rambling about the process etc. on twitter?